A total of 305 primiparae were questioned about their urinary symptoms before and during pregnancy, in the puerperium and 3 months after delivery. All symptoms appeared late in the first trimester and progressively worsened throughout pregnancy, reaching a maximum at term. In 7% (21/293) stress incontinence, and in 4% (12/293) urge incontinence began in the puerperium. 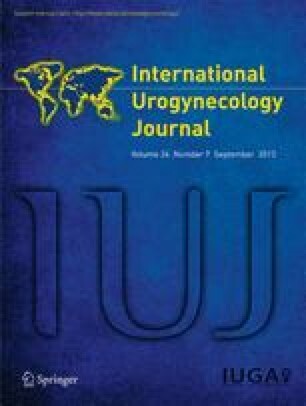 Three months postpartum urinary symptoms in the form of frequency, urgency and urge incontinence had reached prepregnancy levels, while 9 of 88 women who developed stress incontinence during pregnancy and 6 of 21 who developed stress incontinence after delivery, respectively, still complained of this symptom. According to the definition of the International Continence Society only one woman had stress incontinence, while one had urge incontinence 3 months postpartum. None of the 2 women opted for treatment. It emerges that urinary symptoms occur as a natural consequence of pregnancy and delivery, and generally the symptoms disappear within 3 months postpartum. The risk of developing persistent symptoms seems to be relatively low in the primipara.